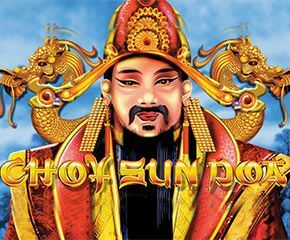 Choy Sun Doa is the symbol of prosperity and Aristocrat games has harnessed this concept to craft a great slot game. The game is set in the cool blue background of snow clad mountains and has a legendary feel to it. The game consists of symbols such as the dragon, a golden crown, a talisman, some books and also the conventional deck of cards symbols such as A, K, Q, J and 10. The game has really pleasing visuals and the soundtrack in the background is pretty ambient as well. The Choy Sun Doa is a 5 reel and 243 paylines game that makes use of Aristocrat’s Reel power design. The stakes levels are flexible from just 25p to £ 125 and the stakes are counted per reel instead of per payline as per convention. The game is suitable for all kinds of slot gamers having thick or thin wallets thanks to these flexible stake amounts. Choy Sun Doa is a game that really does stick to what it promises. The game consists of typical wilds and scatters. However the scatters in the game unleashes a new kind of bonus game. The wilds are symbol substituting wilds. Choy is the wild icon in the game, and whole he can get you one step closer to prosperity through all symbols, his substituting powers don’t work when a scatter comes to the picture. The gold ingot is the scatter symbol and getting just three of these on your plat screen opens the doors to the bonus game. The bonus game gives you a choice between going for less number of free spins but more credit, or more number of free spins and lesser credit. If you are a risk taker you can play for 30,000 coins and just 5 free spins. However the wisest move is to stay in a mid level with 15 free spins and a decent return value. In this round, the wild symbol which only comes in reels 2, 3 and 4 also triggers multipliers. Getting the red book icons on reels 1 and 5 can get you a random multiplier from 2x to 50x as well. Choy Sun Doa from Aristocrat is a great game. The monotony of slot game features have been done away with thanks to the choice in the bonus game. Trying out all the combinations are worth the time. The game has a 95% RTP and you can get lucky through any of these bonus game choices. The game has some really great returns and is truly a gateway to prosperity. Aristocrat has done justice to the theme and offered a great slot game through this concept.